Volvo has revealed a beefed-up version of its V60 estate car. Expect it to start at around £40,000 when it goes on sale in spring 2019. 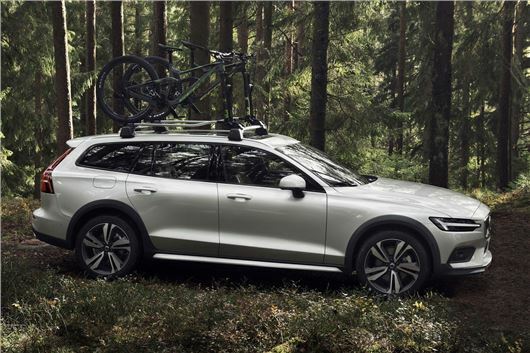 Badged the V60 Cross Country, the new model sits 75mm higher than the regular V60 and features a specially developed suspension and chassis to boost its off road capability, says the manufacturer. Set to rival the Audi A4 Allroad and Volkswagen Passat Alltrack, the V60 Cross Country features extra body cladding and a revised grille to give it a rugged look. Cosmetically, it shares a great deal with the larger V90 Cross Country which went on sale last year. Four-wheel drive is standard - as is a special off-road driving mode with hill descent control, which controls the car's speed down steep drops. As with other models in Volvo's range, the V60 Cross Country is packed with safety kit as standard. It features Volvo's City Safety with Autobrake, which can apply the brakes when required to avoid collisions. Unlike rival systems, it'll recognise pedestrians, cyclists and large animals. Volvo's Pilot Assist features can help with steering, acceleration and braking at speeds of up to 80mph. Prices and specification details are yet to be confirmed, but Volvo's said the V60 Cross Country will initially be available with a D4 diesel engine in the UK. Mild hybrid and plug-in hybrid versions will follow.